Designing with Succulents impressed me so much that I was glad to see that Debra Lee Baldwin had written another book – Succulent Container Gardens. Like her first book, this one is full of beautiful photographs. It lacks the breath-taking scenes of large in-ground succulent landscapes of the first book but for those who cannot plant succulents in the ground because of climate or space, this book is a winner. The first section, “Pairing Plants with Pots”, covers design basics and has an abundance of photographs to illustrate the effect of making a good match. Along with expensive -looking beautifully glazed pots, she pictures miniatures, plain terracotta pots, shells, hypertufa, and “flea market finds.” You don’t have to have a big budget to come up with a striking combination of plant and container. The second section of the book, “Plant Palette”, contains an alphabetical list of the major succulent families from Aeonium to Yucca. There are a few photos for each family and descriptions of the most readily available varieties. I wish there was a photo of every variety named, but the book would have to be fifty pages longer. This section of the book includes using succulents in bonsai gardens. If you like succulents, you probably have more than one. The third section of the book deals with displaying your containers both inside and outdoors (mostly outdoors). Wreaths, topiary and miniature landscapes are illustrated and described, as well as vertical gardens, hanging baskets and tube planters. Part four of the book, “Planting, Care, and Propagation”, covers windowsill gardens, soil, watering and using containers without drain holes. The propagation section includes the author’s experiences starting plants from cuttings and an interesting article on hybridizing succulents by hand-pollinating flowers of the same genus. The instructions are detailed enough that it sounds like something I could try. The part dealing with overwintering covers basic care for an occasional frost to dealing with longer periods of chilly weather. Although the lists at the end of the book only take four pages, they are a part of the book you will refer to often. 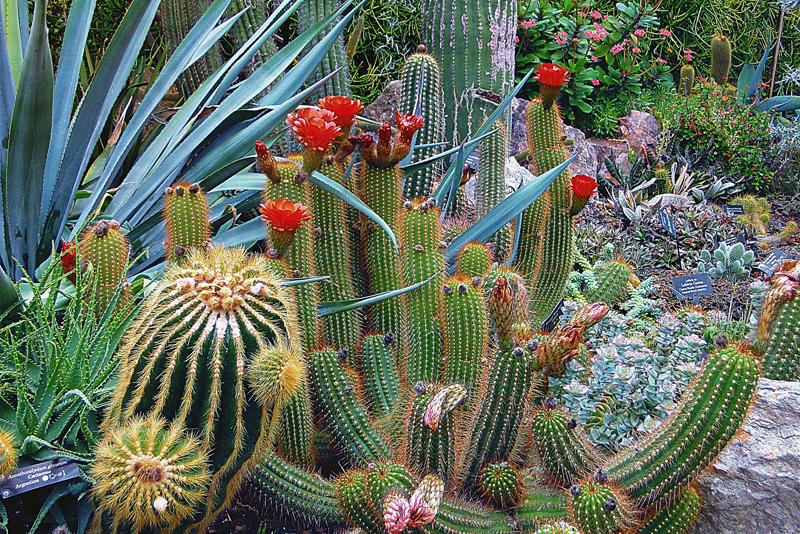 Succulents are listed by height (size), color, flower, textural features and cold-hardiness. The book I used for this review was checked out of the library. It merits a place on my Christmas wish list.